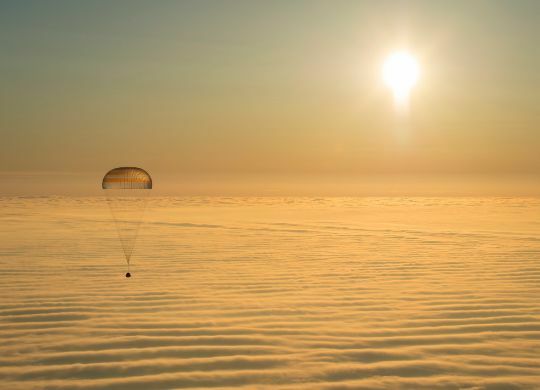 The program is jointly operated by NASA and the US Geological Survey. LDCM will provide moderate-resolution imagery of Earth’s terrestrial and polar regions in visible, near-infrared, short wave infrared, and thermal infrared using two instruments that are installed on the satellite, the Thermal Infrared Sensor (TIRS) and the Operational Land Imager (OLI). Data provided by the Landsat mission can be used for a variety of scientific purposes, allowing scientists to evaluate dynamic changes caused by both, natural processes and human practices. “For decades, Landsat has played an important part in NASA’s mission to advance Earth system science. LDCM promises to extend and expand that capability,” said Michael Freilich, director of the Earth Science Division in the Science Mission Directorate at NASA HQ. 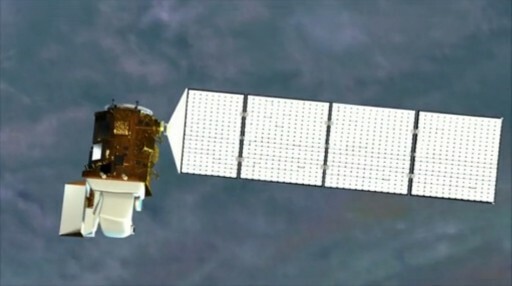 To prevent a gap in Landsat data, NASA has decided to launch the LDCM mission as the most recent addition to the Landsat fleet was Landsat 7 in 1999. Currently, Landsat 7 is the only functioning spacecraft of the program after Landsat 5 accomplished its mission – becoming the longest-operating Earth observing satellite in history. 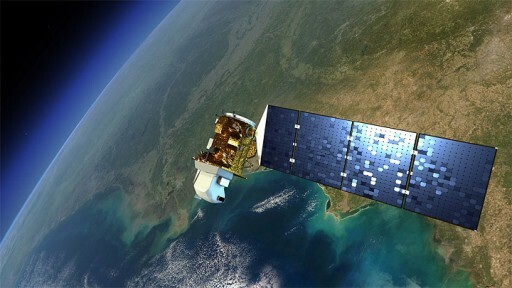 Landsat 5 provided data for 29 years after being launched in 1984 and has recently been decommissioned. But Landsat 7 is also starting to show some significant aging effects, it has lost its instrument Scan Line Corrector and is operating on the backup gyro system. 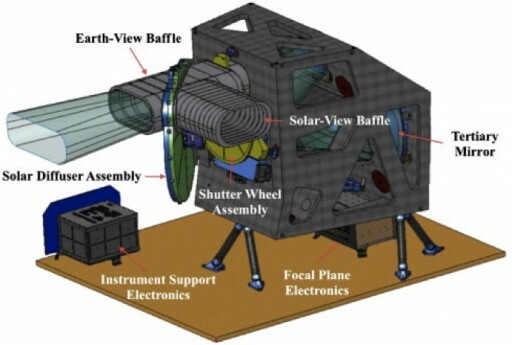 Landsat LDCM was built by Orbital Sciences Corporation (Bus), NASA Goddard (Payload) and Ball Aerospace (Payload) and the satellite will be operated by NASA and USGS (U.S. Geological Survey) once in orbit. As soon as the satellite is operational, it will be re-named Landsat 8. The Spacecraft has a launch mass of 3,085 Kilograms and is based on Orbital’s SA-200HP (now LEOStar-3) platform capable of hosting high-performance payloads for Low-Earth Orbit applications. Orbital used this flight proven satellite us to shorten development and integration time to make sure LDCM can be launched as soon as the government-furnished instruments were ready. 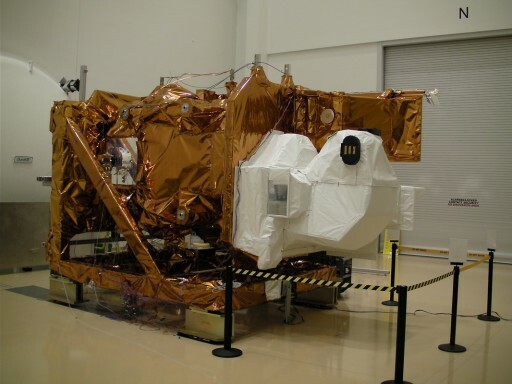 LDCM is carrying two instruments, the Operational Land Imager OLI, built by Ball Aerospace and Technologies Corporation, and the Thermal Infrared Sensor TIRS that was provided by NASA’s Goddard Space Flight Center and Ball Aerospace. OLI conducts measurements in the visible, near infrared, and short wave infrared bands of the spectrum. It is a push-broom sensor with a four-mirror telescope and 12-bit quantization. OLI imagery will have a 15-meter resolution for panchromatic and a 30-meter resolution for multispectral images. OLI provides a 185 Kilometer wide swath, covering large areas of Earth’s landscape while providing sufficient resolution to distinguish features such as urban centers, farms, forests and other features. OLI’s design represents an advancement in Landsat sensor technology and uses an approach that was previously demonstrated by the Advanced Land imager that flew aboard NASA’s experimental EO-1 spacecraft. OLI’s detector arrays have over 7,000 detectors per spectral band, aligned across the focal plane to view the surface with a 15-degree field of view. The detectors are divided into 14 modules arranged in an alternating pattern along the centerline of the detector assembly. 30,000 detectors are used to create panchromatic images. The required spectral differentiation is accomplished with interference filters arranged in a ‘butcher-block’ pattern over the detector arrays. OLI uses Silicon PIN detectors to acquire data in visible and near- infrared light and Mercury-Cadmium-Telluride detectors are used for the three infrared bands. This push-broom design allows the instrument to become more sensitive while reducing the number of moving parts. The OLI telescope views Earth through a baffle that extends beyond the aperture stop. A shutter wheel assembly is located between the baffle and aperture stop and can be opened and closed by rotating it to place a hole in the appropriate positions. A Solar-View Baffle intersects the Earth-View Baffle at 90 degrees and a diffuser wheel assembly dissects the angle. The diffuser wheel has a hole that is positioned to allow light to enter the telescope for Earth observations. Solar viewing is accomplished by rotating the diffuser wheel. Solar observations are required for instrument assessments. For additional assessments and calibration, the instrument contains two stimulation lamp assemblies each holding six lamps. With the shutter closed, these lamps will illuminate the entire focal plane for calibration operations. The instrument has an improved signal to noise ratio and engineers expect more reliable and improved performance from the instrument. OLI has a life expectancy of at least five years. TIRS, the second instrument of the satellite, will measure land surface temperature in two thermal bands using new and improved technologies. Previous Landsat spacecraft made measurements of Earth’s thermal energy that were invaluable for water resource managers that tracked how land and water are being used. To prevent a gap in thermal data provided by Landsats 5 and 7, a decision was made to integrate an instrument in LDCM that surpasses the capabilities of its predecessors. 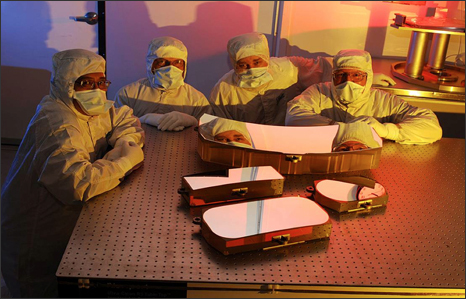 TIRS utilizes Quantum Well Infrared Photodetectors (QWIPs) to detect long wavelengths of light that is emitted by Earth’s surface. The intensity of the thermal infrared radiation depends on surface temperature. QWIPs are a relatively new, lower-cost alternative to conventional infrared technology. The instrument was developed at NASA’s Goddard Space Flight Center. Two thermal infrared wavelengths bands can be observed by TIRS which allows the instrument to distinguish between surface and atmospheric temperature. The detectors consist of Gallium Arsenide semiconductor chips that trap electrons in a certain energetic state until they are excited by thermal radiation and are elevated to a higher energetic state. The excited electrons then create an electrical signal that can be recorded to form a digital image that shows the temperature of an area on Earth. TIRS is a push-broom sensor featuring a focal plane with long arrays, similar to OLI. A refractive telescope focuses a beam of thermal radiation onto a cryogenically cooled focal plane to provide a 15-degree field of view matching the 185-Kilometer swath of OLI. 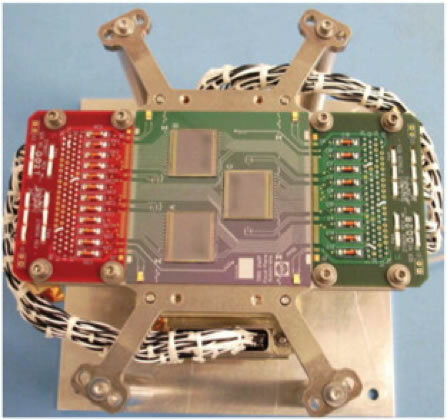 The focal plane is comprised of three detector assemblies with quantum-well-infrared-photodetector (QWIP) arrays arranged in an alternating pattern along the focal plane centerline (similar to OLI). The focal plane is covered by spectral filters that only transmit the two bands that are of interest for thermal measurements. Each of the QWIP arrays features 640 detectors. With some overlap in between modules, the complete detector array spans 1850 pixels for a 185-Kilometer swath. Thus, TIRS thermal imagery will have a resolution of 100 meters. 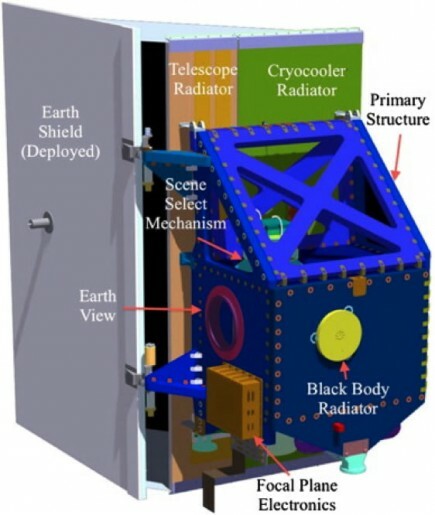 TIRS has a a mirror that is controlled by a scene select mechanism can chose the target of the instrument and alternate between an Earth view for science observations, and an internal blackbody and a deep space view for instrument calibration. This design allows LDCM to maintain its nominal Earth-pointing attitude while TIRS performs calibration. The focal plane has to be kept at a constant temperature of 43K for the QWIPs to function. 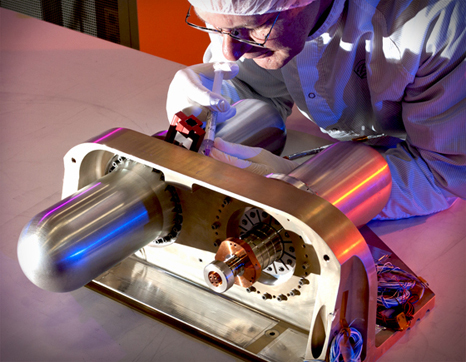 This is achieved by a mechanical, two-stage cryocooler that was built by Ball Aerospace. 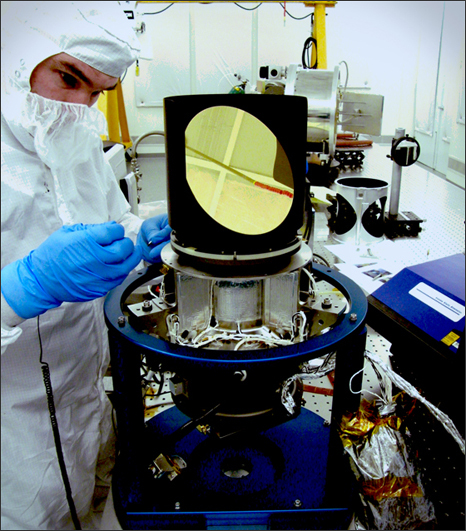 Two radiators are mounted on the instrument structure – one radiates heat from the cryocooler while the other one is used as part of TIRS’ thermal control system that keeps the instrument at 185K. The cooler and the main instrument have a design life of three years. The satellite provides excellent three-axis-control capability with zero momentum bias and nadir pointing capabilities. LDCM’s pointing stability is 6.02 microradians. A monopropellant Propulsion System using 395 Kilograms of Hydrazine fuel can be used to perform large attitude maneuvers and orbit adjustments. It features eight 22-Newton thrusters. The satellite is powered by a single 9 by 0.4 meter solar array that is deployed once in orbit and a 125 Ampere-Hour Nickel-Hydrogen battery stores power for night passes. End of Mission power is 3,750 watts. The mass of the fully fueled satellite bus (without instruments) is 2,071 Kilograms. The satellite platform is 3 meters long and 2.4 meters in diameter. The spacecraft offers a 3.14 terrabit solid-state data recorder with X-Band data downlink at a data rate of 384Mbps and an S-Band data rate of 260.92 Mbps. Three ground stations will be used to downlink data acquired by LDCM: Gilmore Creek, Alaska; Svalbard, Norway; and Sioux Falls, S.D. The data will be archived and distributed at no cost to users from the USGS’s Earth Resources Observation and Science Center in Sioux Falls. Mission Operations will originate from NASA’s Goddard Space Flight Center. The Mission Operations Team will use Landsat 8 to fulfill its long-term goal specified in the Long-Term Acquisition Plan-8, but also for time-relevant observations for ongoing studies, to image natural disasters and a number of other applications. On average, 400 image requests will be made per day. Landsat 8 operates from a 705-Kilometer, circular Sun-Synchronous Orbit with an inclination of 98.2 degrees. In its polar orbit, Landsat 8 makes 14 orbits per day and fly over the same location on Earth every 16 days (233 orbits). The satellite has a design life of 5.25 years with a goal of reaching 10 years.